A busy new year, with trips, exhibits but the best of it might have been this, something that I’ve holding to myself for a couple of weeks: having one of my photos reaching the final and being commended in the Open Competition of this year’s Sony World Photography Awards. More than the accomplishment itself, winning or reaching the later stages of such competitions with photos that truly represent you as a photographer are a sign that you’re doing it right, and that’s what really makes me happy. The funny thing is that this obviously is a nature photo, but was shot while in a photo trip where the focus was a totally unrelated subject; the solstice traditions of northern Portugal. While driving from our hotel in nearby Bragança, me and Emanuele couldn’t stop noticing how stunning the early mornings and late afternoons were, with the soft winter light and the frost in the darker corners of the road. 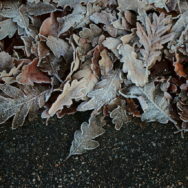 Some frozen leaves by the road caught my attention and that was it, sometimes a nice photo is by your feet. I’m glad that we stopped there, more than once actually! I’ll leaving you with the winning shot, and a few more taken during those days at the road that caught my attention. Leaves of Pyrenean oak lying by the road. When the frozen parts of the forest get the first rays of light it’s truly magical. The fog lowering on the valley at the end of the day. Taking the herd back home after their full meal.